Death in Paris is a mashup of some of the most favorite literary tropes. 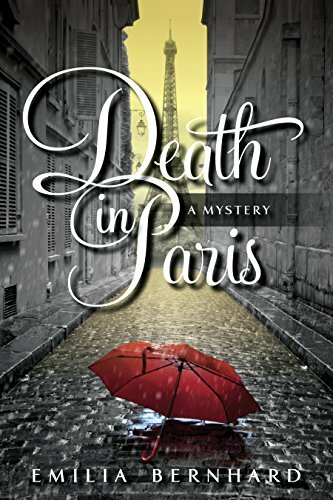 An American expatriate in Paris, fish out of water, suspicious death of an old friend, curious amateur sleuths, a surprise inheritance, and a female buddy romp. Author Emilia Bernhard gives the reader all that as well as a you-are-there tour of Paris. She thoughtfully includes a list of useful French words and phrases at the back of the book for readers not familiar with the language. In the book, American Rachel Levis (pronounced Leviss, not Levi's) arrives in Paris after college, falls in love with the city, and just stays. When an early love affair with Edgar Bowen, a wealthy older man, flames out she meets and marries expat banker Alan. Twenty years later she learns that Edgar has died of a heart attack while dining. After the initial shock of the news and twinge of nostalgia, Rachel is jolted by two memories. Edgar was a healthy, fit man unlikely to die of a heart attack, and the bottle of wine on his dinner table was rosé. Edgar despised rosé so much he wouldn't allow it on his table. "Together and apart they had watched countless true crime programs, each charting the investigation of a suspicious death, each investigation leading to a successful arrest. Magda might not be Columbo and she might not be Sherlock Holmes, Rachel thought, but after all those documentaries, we know our way around a murder." Days later, Rachel receives a phone call from an attorney inviting her to attend the reading of Edgar's will, because he has made her a bequest. Naturally she agrees and is surprised and happy to learn that Edgar has asked that she take charge of organizing and cataloguing his extensive personal library that includes many valuable antiquities and collections. In return, she may choose a book of her choice. Well, who wouldn't jump at an opportunity like that even if they weren't investigating the deceased's murder? Rachel sees this as the perfect opportunity to spend hours and hours in Edgar's home snooping for clues. She is spurred on when the local wine merchant tells her that Edgar's standing wine order included a substantial amount of rosé. He didn't drink it. Who was that for? In time, Rachel narrows down the list of suspects to four: the ex-wife Mathilde, Catherine the lover, Elizabeth the personal assistant, and son David. She excludes Fulke, the faithful butler she has known and adored since her affair with Edgar all those years ago. Along the way, the narrative slows down considerably. Day by day when Rachel finishes her cataloguing responsibilities at Edgar's library, she returns home and in the style of Sherlock Holmes and Watson, she and Magda have long, long, long conversations mulling over what she has learned about the household and the suspects. They argue, they banter, and endlessly discuss each suspect in detail, dissecting every word each has said, critically examining every movement each has made, speculating and ruminating on each suspect's possible motivation for murder. "Where was the sleuthing, the tracking, the ducking and diving? Where were all the capital-d Developments? Already two weeks had passed since Edgar's death, and all they had were conversations and theories. It really wasn't all it was cracked up to be in books and on TV." It's apparent that both Rachel and the author carry significant affection for Paris. Francophiles in particular will enjoy and be familiar with the descriptions of Parisian food, clothes, fashions, hairstyles, boulevards, streets, shops, cafes, language, and culture. The reader will find the ending surprising, yet not a surprise.